The Updates tab is used to check the status of downloaded rules packages and to download new updates. The table shows the available rule packages and their current status (not enabled, not downloaded, or a valid MD5 checksum and date). 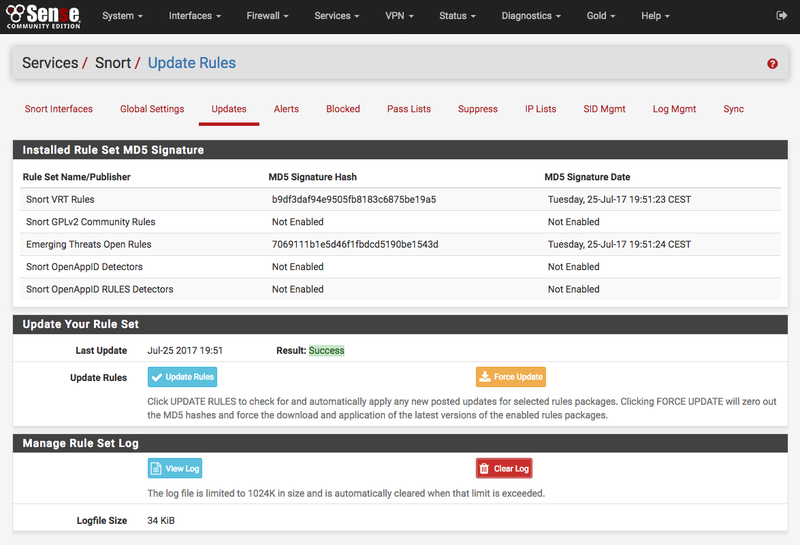 Click on the Update Rules button to download the latest rule package updates. If there is a newer set of packaged rules on the vendor web site, it will be downloaded and installed. The determination is made by comparing the MD5 of the local file with that of the remote file on the vendor web site. If there is a mismatch, a new file is downloaded. The FORCE button can be used to force download of the rule packages from the vendor web site no matter how the MD5 hash tests out. In the screenshot below, the Snort VRT and Emerging Threats Open rule packages have been successfully downloaded. The calculated MD5 hash and the file download date and time are shown. Also note the last update time and result are shown in the center of the page.